Tokyo, Japan -- In Japan the individuals Sesshu Toyo (1420-1506) and Sengai Gibon (1750-1837) have left a rich legacy behind because even today these two intriguing people continue to fascinate people who adore art and culture. Art and religion were instrumental to these two powerful characters even if the outcome to these two areas were very different. For Sesshu Toyo he sometimes felt entrapped by conservative aspects and ritual related to Rinzai Buddhism. However, for Sengai Gibon spirituality was everything therefore he didn’t fully utilize his artistic skills until much later in life. Sengai Gibon also neglected the trappings of focusing overtly on high culture and traditional artistic norms related to the world of Rinzai Buddhism when it comes to art. Instead his art highlights humor but with a deeper message providing the individual shares the same philosophical background. Of course, the interpretation, connection and meaning will vary dramatically between individuals who view the art work of Sengai Gibon. Also, Sengai Gibon understood the need to attract all people to Rinzai Buddhism irrespective of background therefore light themes to his art could also breakdown many barriers. Likewise, but for very different reasons, the real art ability of Sengai Gibon will never be known. 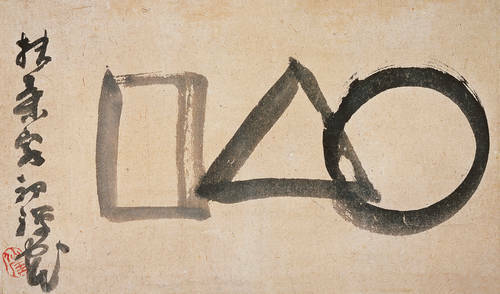 After all, unlike Sesshu Toyo, he limited his artistic nature in order to focus on Rinzai Zen Buddhism. Therefore, Sengai Gibon only focuses on art to a major degree when he reaches the later stages of his life. Not only this, but Sengai Gibon wants to enlighten all and sundry towards the Buddhist faith he holds dearly therefore his thinking was more expansive when it comes to this dimension. Art for Sesshu Toyo took pride of place in his heart but for Sengai Gibon art was a tool to express humility, humor, Buddhism, and thought provoking questions. The reason I state “humility” is because Sengai Gibon had huge potential but in time “all potential turns to dust” and only “a shell” remains of people who are remembered in history. Therefore, reality is clouded based on different perspectives and how individuals view the world. Some articles are republished on the need to highlight aspects of Japanese art and culture to a wider audience.